Posted on Mon, Feb 25, 2013 : 2:59 p.m.
DTE Energy customers shouldn’t have to pay $87 to have a smart meter taken off their home, Michigan Attorney General Bill Schuette says. Customers should also be able to keep their analog meter, Schuette said in a written opinion. In the statement filed this month by Schuette in response to ongoing state-level hearings on Detroit Edison's proposed opt-out program for its customers who don’t want smart meters, Schuette said he didn’t think fees the company had proposed customers pay were justified. 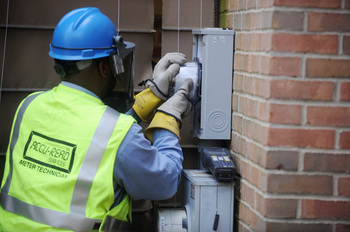 A worker installs a smart meter at an area residence. DTE Energy is in the process of developing an opt-out program for customers who don't want the device, at the request of the state. DTE’s proposed program has been under review by the Michigan Public Service Commission for about seven months after the regulatory body requested that DTE develop one. DTE is anticipating about 4,000 customers may make use of the program, which would not require customers to submit a reason for opting out. Smart meters are digital devices that track energy usage. DTE is using them in place of older analog meters. The new devices are equipped with radio transmitters to wirelessly communicate electricity consumption information to the company, allowing Detroit Edison to remotely monitor power outages and usage. A number of Ann Arbor residents have been vocal as smart meters have been installed and during the state hearings, and have submitted pages of personal testimony to the commission on adverse health effects they report have come from the installation of smart meters in their neighborhoods and throughout the community. However, much of the submitted testimony was stricken from the record of the hearing in January because the administrative law judge hearing the case, Judge Dennis Mack, did not deem it to be relevant to the issue of whether customers should have to pay to opt out of the smart meter program. Cynthia Edwards, 59, an Ann Arbor resident, says she’s sensitive to the electromagnetic waves that smart meters and other devices emit and submitted some of her personal testimony to the hearing. Mack removed the testimony from the record. Edwards said even though her testimony is no longer on the official record, it was heard by each of the members of the Public Service Commission during the initial proceedings. “We’re really glad that (Schuette) gets at least one aspect of it,” Edwards said in reaction to Schuette’s opinion. However, Edwards said she’s not confident that the Michigan Public Service Commission will heed his advice. DTE Energy developed an opt-out plan for smart meters in July at the request of the commission. The plan called for customers to pay an initial $87 charge if they did not want a smart meter on their homes, and then to pay an additional $15.60 per month to have a DTE Energy technician come to the home and read the meter. Under its proposed opt-out program, DTE Energy would not remove the digital meter from the customer’s home, and instead would turn off the radio transmitting portion of the device. Attorney General Schuette said in his opinion that the fees DTE Energy was proposing were not justified. A cost schedule DTE Energy submitted during the hearing stated labor and overhead costs average about $61.46 per hour. It included additional fees for training and billing. At the minimum, Schuette stated the commission should reduce the initial charge for opt-out customers to $67.20 from the proposed $87. For each customer every month, DTE claimed during the hearing it would cost $8 to read a meter, $2 for a supervisor, $3.60 for two billing analysts and $2 for a route coordinator. DTE bills its customers now a meter-reading rate of $0.45 per month. Schuette recommended that the commission reduce the proposed new monthly charge for having a technician visit a residence to read the meter from $15.60 to $9.80. Both the new digital meters and old analog meters have the same life span of 20 years, according to Schuette’s statement. Turning off a digital transmitter takes approximately 45 minutes, and exchanging one meter for the other takes approximately five minutes, according to evidence submitted by DTE Energy during the hearing. Reply opinions to the Michigan Public Service Commission regarding the hearing are due by Tuesday, said Judy Palnau, spokeswoman for the commission. Judge Mack is scheduled to issue his decision March 29, Palnau said. After the judge hands down his decision, the commission will review it and issue its final order to DTE Energy. The date of the commission’s final order has yet to be determined, Palnau said. Amy Biolchini covers Washtenaw County, health and environmental issues for AnnArbor.com. Reach her at (734) 623-2552, amybiolchini@annarbor.com or on Twitter. Tue, Mar 12, 2013 : 6:12 p.m. The solution is &quot;hash tags&quot;. Put a hash tag on your electric meter. The reading can be uploaded from your phone. That way, no wireless router attached to your home. A wireless router attached to your home enables law enforcement to see through your home. Check out popsci.com seeing through walls with a wireless router. the answer is &quot;hash tags&quot; and a camera cell. Thu, Mar 7, 2013 : 4:22 p.m.
DTE installed a smart meter several months ago and a meter reader still reads the electric meter. What was the point of them? Tue, Feb 26, 2013 : 7:22 p.m.
Paying an Employee (so he has a JOB) better then HIM being ...UMEMPLOYED and living on OUR welfarechecks. Well you have a choice ..
Tue, Feb 26, 2013 : 7:14 p.m.
OUR SENATOR Debbie STABENOW already PAYED for the meters.at a cost of TAXPAYEER 4 84 MILLION from Washington..thank her! Tue, Feb 26, 2013 : 6:22 p.m.
DTE is a regulated electric monopoly. Their residential customers do not typically have a choice, or alternative. How they set prices is very much the Attorney General's business. In this case, he finds that they are artifically raising prices above what is reasonable. Tue, Feb 26, 2013 : 3:19 p.m.
How about the fact that they want to eliminate jobs, or you as the customer can pay there wages so we can make even a bigger profit . It is the Republican way! less over head more Profit!. that's what I read out of it. Heck why should the gas companies be the only one making a $3.billion dollar profit every quarter. Wed, Feb 27, 2013 : 2:11 a.m.
OMG, another AA bleeding heart liberal blaming the Republicans for her warped mind. Tue, Feb 26, 2013 : 2:57 p.m. When is the AG going to tell Apple they can't change the plug on their iPhone 5? Or how about I want my old Ann Arbor newspaper back in analog form because I'm sure reading this new online format is causing me to become ill due to my wireless ethernet. There were good reasons for these changes and they aren't done lightly. DTE is investing in a smart grid which is good for this state. Tue, Feb 26, 2013 : 7:19 p.m. IT is OUR TAXPAYER MONEY from washington Give BY SENATOR DEBBIE STABENOW to the tune of $ 84 million ..your money! Tue, Feb 26, 2013 : 6:23 p.m. I am not forced to buy from Apple. I am forced to buy from DTE. See the difference? Btw, when are my bills going to go down from this smart grid, which you say is &quot;good for this state&quot;? Tue, Feb 26, 2013 : 2:52 p.m. I am not sure why Shuete has any role in the decision making of the Public Service Commission. I suspect that he sees this opinion as pandering to the voters as the election approaches. Seems he misread the voters. Tue, Feb 26, 2013 : 6:24 p.m.
DTE is a regulated monopoly. In this case they have arbitrarily set prices too high in order to boost profits. Tue, Feb 26, 2013 : 5:11 p.m.
Oh yes. You can bet if it were a private company he would be all for it. Tue, Feb 26, 2013 : 2:11 p.m. I never thought I was agree with Schuette on anything. Tue, Feb 26, 2013 : 1:42 p.m. Anything Schuette says is &quot;bad&quot;, I immediately think the opposite. Tue, Feb 26, 2013 : 2:50 p.m.
Tue, Feb 26, 2013 : 1:36 p.m.
What I want to know is why the $6.00 service charge is still on my bill, a year after the smart meter was installed. DTE told me over a year ago that that $6.00 service charge was to &quot;send a worker to read the meter.&quot; This was prior to installation of the smart meter, which is now read remotely and does not require anyone to come to the residence and read the meter. Now, they are saying that the service charge of $6.00 stays on the bill. This is a total rip off. Tue, Feb 26, 2013 : 2:41 p.m. Think of it as a convenience fee. Tue, Feb 26, 2013 : 1:13 p.m. I lol @ all the people trying to run DTE. It's a company, they can run their business however it is best for them to do so. They're trying to employ inefficiencies they can take advantage of for years to come, and pass down to customers, and all anyone can do is whine about it. The new meters don't control your mind nor anything else, they're just reporting back usage so the power company can get realtime info on usage/outages and accurate readings for billing without having to employ someone for busywork. It's automation progress people, get with the program. It's happening everywhere and in every industry. You don't like it? Create your own competing power company and employ thousands of people to run around and read meters like they have been since the service started. Then listen to everyone whine about higher power bills due to your legacy staffing costs. Tue, Feb 26, 2013 : 2:49 p.m. I am not opposed to the smart meters. You are wrong, however, that they can run their business however they see fit. They are a regulated monopoly and the government has an integral role in assuring this business operates in the public interest, well at least not in opposition to the public interest. You don't like it? Let any number of utility providers use the infrastructure that is now exclusive to DTE. Tue, Feb 26, 2013 : 1:14 p.m.
*eliminate inefficiencies or employ inefficiencies Grammar nazis be sure to ignore the point when attacking. They don't allow editing here. Tue, Feb 26, 2013 : 12:57 p.m.
Tue, Feb 26, 2013 : 4:16 a.m. So this article indicates that even opting out, and paying the outrageous fees, results in a smartmeter with a transmitter being installed. We are to believe the transmitter is disabled. Any new news of smartmeters being hacked? Tue, Feb 26, 2013 : 1:27 p.m.
We are to believe that the current analog meters don't have transmitters? And of course you know that the compact fluorescent lights have transmitters, right? That's why they're making the incandescents illegal. If you're going for a crazy conspiracy theory, go big or go home! Tue, Feb 26, 2013 : 4:34 a.m.
Tue, Feb 26, 2013 : 4:13 a.m.
My issue with the charge is they have to come out and read the gas meter anyway. Why is there more cost..they are stacked ontop of each other. Tue, Feb 26, 2013 : 2:36 p.m.
Gas is not always provided by DTE and the individuals doing the readings are often not the same. Tue, Feb 26, 2013 : 12:35 a.m.
Tue, Feb 26, 2013 : 3:35 a.m.
Tue, Feb 26, 2013 : 3:03 a.m.
You can blame the government mandate, and of course the company that failed to trim the trees and blacked out half the country. Tue, Feb 26, 2013 : 12:26 a.m. I have had the new meter for 6 months now. My bill has actually gone down from the old analog meter. I actually read my meter daily to see how my usage is. I can figure out what my electric will cost before I even get my paper bill. Tue, Feb 26, 2013 : 12:13 a.m. I have a smart meter and I am fine with it. Tue, Feb 26, 2013 : 1:11 a.m.
For now. Cancer cells take time to develop. Give it about 5-10 years. Mon, Feb 25, 2013 : 11:33 p.m. I've had horrible AM radio reception since mine was installed. a constant, strong 60-cycle buzz all day long. Tue, Feb 26, 2013 : 3:06 p.m. I don't know their transmit frequency but it's certainly not 60 Hz. And the power into the device is probably direct current so I think you should look elsewhere for your interference. Tue, Feb 26, 2013 : 12:04 a.m.
Maybe that is that is the wi fi interference we keep hearing about. Mon, Feb 25, 2013 : 10:41 p.m. If those folks don't have to worry about their meters, they will have more time to look for Big Foot. Tue, Feb 26, 2013 : 12:14 a.m. Already found him. He walks Michigan Avenue in Ypsi. Mon, Feb 25, 2013 : 10:14 p.m. While we're at it, can I get a meter with no sixes? I can't take the risk of it coming up with &quot;666&quot;. Mon, Feb 25, 2013 : 10:03 p.m. Here we go again with the &quot;fringe science&quot; community blaming the new style electric meters for a host of maladies and problems, just because a radio frequency (RF)is used to transmit electrical usage data back to DTE from the meter's location. These &quot;experts&quot; must be aware that we are constantly inundated with a wide variety of RF at various frequencies and power levels such as TV broadcasts, AM/FM radio, cell phones, Defense Department transmissions, and the list could go on and on. Your electric meter's transmitter is extremely low in power. Also, be aware that the earth is constantly bombarded by RF from outer space. If one wants to avoid most RF, a room completely shielded by copper and well-grounded should do the trick. If you do not want these new meters, get some candles and discontinue DTE's electric service. Tue, Feb 26, 2013 : 6:37 a.m.
Why can't I have some real competition in choice of electric power provider? Make the grid a public resource and let different businesses supply power to the grid. Tue, Feb 26, 2013 : 4:55 a.m.
@Tyrone Shoelaces, Not quite, climate change deniers are the fringe, but dont let facts get int he way of your story. Mon, Feb 25, 2013 : 11:34 p.m. Fringe science isn't just for climate changers anymore! Mon, Feb 25, 2013 : 9:20 p.m.
yeh, and I am allergic to airplanes flying overhead. Can the FAA reroute them for me? Now we have people in AA with microwave receivers built into their teeth and they can sense the radio signals. Do they also shun cell phones, radios, tv's, microwave ovens, keyless entry systems, etc? And where is Schuette coming from? This is how the Attorney General creates a business friendly environment to lure new Companies to Michigan? Give me a break! Wireless meters save money and gas, a great combination. Mon, Feb 25, 2013 : 9:14 p.m. So this is half the battle with DTE, why is no one addressing the outrageous ammounts they are charging all of us who did convert? In excess of $400-500 dolalrs a month regardless of usage. The created a vaccum and rolled off on the consumers. Mon, Feb 25, 2013 : 9:24 p.m.
what are you talking about? Do you have data or are you just blowing smoke? Mon, Feb 25, 2013 : 8:51 p.m.
SMs are for control. Not to save people money or the environment. As the former CIA director, Petreaus said in Wired Magazine, &quot;We'll spy on you through your dishwasher.&quot; I didn't say it. It was the director of the CIA. How do you spy on people through the dishwasher, you need a spying device to transmit the data. SMs will also be used to increase electric rates selectively and restrict electricity use. Giving DTE complete control over your electricity use. None of this is possible with analog meters. If anyone doubts me, do your own research. Tue, Feb 26, 2013 : 3:12 p.m.
My heat/air conditioning unit has a separate smart meter and I get a lower rate because DTE can turn it off if their turbines are going to explode due to excessive demand. Whay does a reasonable system of control become a conspiracy theory? I would prefer a controlled shutdown to a days long catastrophic failure anyday - including doomsday. Tue, Feb 26, 2013 : 6:19 a.m.
G. Orwell is correct about Samsung TV's if the TV has a camera and is connected to the internet. The point about knowing which appliances are on and if people are home is correct to a certain degree of probability; who has access to this info and how it is used is an important question. Tue, Feb 26, 2013 : 4:54 a.m.
Other than the fact that NOBODY is required to have any meter. You do not need to have your home on the grid. Or better yet, DONT PAY YOUR BILL. Produce your own electricity. Your understanding of the constitution is delusional at best. Probably a Thomas More lawyer of some sort. Tue, Feb 26, 2013 : 1:22 a.m.
Mon, Feb 25, 2013 : 10:31 p.m.
&quot;do your own research&quot; --- we're talking Alex Jones, right? I don't think there's enough tin foil to go around. Mon, Feb 25, 2013 : 10:15 p.m.
Mon, Feb 25, 2013 : 8:45 p.m.
Tue, Feb 26, 2013 : 5:54 p.m.
Don't forget the part where the Michigan PSC is paid for by the utilities it purports to regulate. That's the best part. Mon, Feb 25, 2013 : 10:56 p.m.
...just edit it into the article. Mon, Feb 25, 2013 : 8:41 p.m.
Mon, Feb 25, 2013 : 8:42 p.m.
Minor glitch with the URL link. It's been fixed. Mon, Feb 25, 2013 : 8:38 p.m.
Customers who are objecting to the meters but are unwilling to pay the opt-out fees can still opt for tin foil hats. That's cheaper. If they ask nicely, DTE might even be willing to provide them for free. After all, they already make a lot of money from selling electricity to the aluminum foil makers. Why would I trust them to give me a tinfoil hat that works? THEY ARE PART OF THE CONSPIRACY!!!!! Mon, Feb 25, 2013 : 9:11 p.m.
Kafkaland. You read my mind (which might be a scary thing for you). Tin foil hats indeed. Maybe even an inexpensive necklace of garlic to keep the vampires away. The scaredy-cats can wear both while watching reruns of the Twilight Zone. Mon, Feb 25, 2013 : 8:34 p.m. It is amazing how Schuette can be wrong on every single issue. Tue, Feb 26, 2013 : 2:18 p.m.
Mon, Feb 25, 2013 : 9:21 p.m. So true! But he could be on the opposite side from unanimous Michiganders and he'd still fight for his way. Mon, Feb 25, 2013 : 8:24 p.m.
Having to employ a person to read analog readers, especially when at the most there might be only a few per neighborhood seems onerous to me. Not to mention the cost of a vehicle, fuel, maintenance, equipment, etc. I think the attorney general should consider checking the math on this ruling. Tue, Feb 26, 2013 : 4:51 a.m.
Tue, Feb 26, 2013 : 1:12 a.m.
Part of the readers responsibility is to report any unsafe conditions with utlities that may be hazardous to the homeowner, along with making sure that tying into the gas or electrical lines for free power which happens quite frequently. Mon, Feb 25, 2013 : 11:21 p.m.
Maybe he understands that the cost savings you mentioned will not be passed onto the consumer and therefor is of no benefit to the consumer. Allowing someone to remain employed sounds like a better deal to me. Mon, Feb 25, 2013 : 8:12 p.m.
Are these meters more dangerous wearing a cell phone or two? or Having a wireless computer home network system in our house? Tue, Feb 26, 2013 : 4:12 a.m.
Smart meters forward data from other smart meters, as part of a grid network. As a result of that forwarding, or other data collection, they may transmit continuously. Tue, Feb 26, 2013 : 2:48 a.m.
Cellular is far stronger than wifi, and wifi is even stronger than these meters. To top it off, the meters only transmit once a day versus constant signals of wifi and cellular. Face it, in any given neighborhood, you bathed in your neighbors wifi and cellar signals, and have far more to worry about than a simple smart meter. If you going to get any health affects, its from you cell phone next to your head, or your neighbor walking down the street talking on the phone. The meters are far less than a health concern to the things we deal with daily. Mon, Feb 25, 2013 : 9:19 p.m.
Mon, Feb 25, 2013 : 8:29 p.m. I don't think they are. The smart meters are only on when needed, for a short period of time, and at levels much lower that a cell phone, wireless router, or a microwave oven.